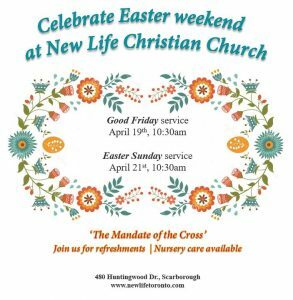 Invite your family and friends to our Good Friday and Easter Services. 10.30 – 12.30 followed by fellowship. Sunday School takes place for children aged 5 – 12 during our service. Nursery available during service time. Every Tuesday at 7.00 PM ~ Join us for a time of Bible Study and Prayer. In you are interested in joining our Young Adults group, Teen Bible Studies, Life Groups, please contact our Church office for more information. Copyright © 2019 New Life Christian Church. All rights reserved.